It's day 5 of the Olympics, which means I've started to find Hazel Irvine oddly attractive. But no matter, because there's SPORT to be viewed. Yesterday, I mentioned the fact that I'd been watching the men's tennis, so now is as good a time as any to hold forth. For a start, the tennis is - aside obviously from the weightlifting - the first sport I have actively sought out so far at the Beijing games. I really do like a bit of tennis. I've watched Wimbledon every year since the days of Ivan Lendl in shorts so short they gave him a wedgie. In recent times, I've had the man love on for Roger Federer. For me, he is the single finest sportsman in the world, not for his results but for his style - power, grace and breathtaking ability. This year, I've noticed a change in Federer. His shoulders seem down, perhaps crushed under the weight of his record-breaking spell at number 1, perhaps with the looming spectre of the record 14 Grand Slam titles of Pete Sampras. In fact, BBC commentator Sam Smith probably hit the nail in the head during his second round match yesterday. Federer is spooked by the first man to come along and really be able to go toe-to-toe with him, Rafael Nadal. Nadal has already ended Roger's epic run on grass courts, plus deprived him three times at Roland Garros of the French Open title which would probably secure Federer's place in the annals. Next week, he will take his world ranking, meaning Federer will not be the top ranked player in the world for the first time in five years. It was inevitable, of course. Every great sportsman will always encounter those two great enemies - time and the young player who they had been to the previous generation of stars. For Federer, though, it must be hard to take. He is still demonstrably superior to more or less everyone else on the tour, but Nadal is just brutal. Federer has spoken of his desire for an Olympic Gold for years, but now, in 2008, it's a matter of some urgency. He's now 27, meaning that he may not even still be playing when the games comes round again. Furthermore, in a season where 3 Grand Slam titles would have made him the Open era's most successful ever player, he has so far won none, beaten to the post by the young guns of Novac Djokovic and Nadal. He's just not accustomed to this sort of pressure, and it is fascinating to see how he handles it. He makes what I consider to be some odd choices. Firstly, the Federer travelling entourage does not contain a permanent coach, a man to be able to be an extra pair of eyes, to point out things which the great man may not even have considered. Secondly, and more Beijing-specific, he's opted to not stay in the Olympic village. His reason for this is that the number of people who want pictures and autographs in there become a distraction to him. It's an argument which I find difficult to dismiss, as I find it perfectly plausible that Federer is so afflicted with fans and well-wishers wherever he goes. However, I can't help but feel it's a shame, and worryingly, increasingly common amongst the Games' top professional sportsmen. Looking at this from the other angle, the semi-pro sportsman who has delightedly qualified to represent their country is naturally going to be disappointed that any chances to meet world class sports stars in the village has been deprived to them because of Ramada Jarvis. It seems to go against a bit of the Olympic spirit to me, and I was pleased to learn that Rafa Nadal is staying in the Olympic Village, reportedly starstruck. My fear is this: how long before the village just becomes a ghetto for the also-rans? Losing is an occupational hazard of the sportsman of whatever level. But losing to someone who helicopters their way in, speaks to no-one, wins and then buggers off is hardly in-keeping with the ideals of sportsmanship. 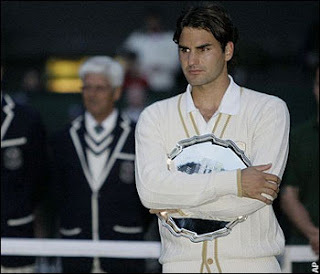 This said, no-one can accuse Federer of bad sportsmanship. In the last 5 years he has been an exemplary gracious winner, and all signs are that he is equally adept at being a gracious - if unwilling - loser. It will probably stand him in good stead. So far, Federer has been as imperious as expected against some low-ranked opposition, whilst Nadal blustered to a three-set win in his first match. Yesterday, however, Rafa absolutely blitzed Lleyton Hewitt 6-2, 6-1. I'll be surprised if Sunday's Olympic final isn't another installment of Federer and Nadal's summit duel. But as it stands, I'd expect Nadal to be the favourite. My hope is that Federer, if he loses out on a gold medal, doesn't lose out on enjoying the Olympic experience too.